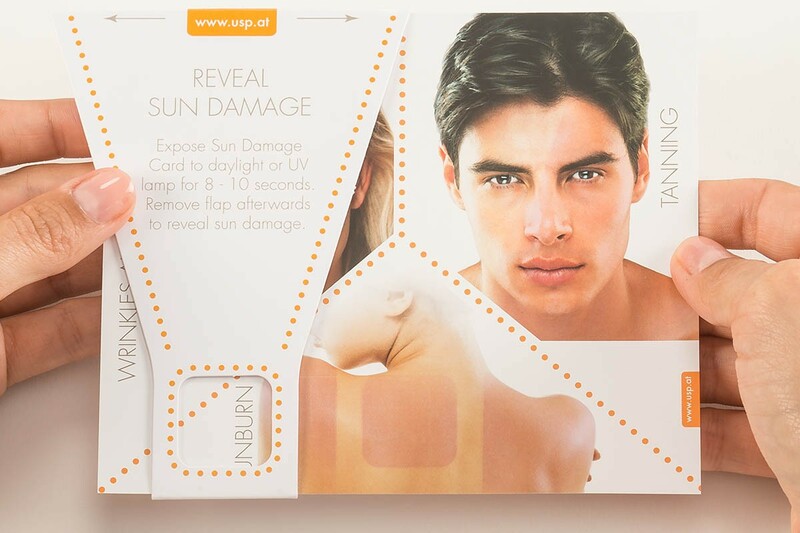 USP Solutions’ Sun Damage- Sunburn and Tanning Demo Tool is reliable and easy-to-use. It enables consumers to touch and feel your brand, thus emotionally engaging them. 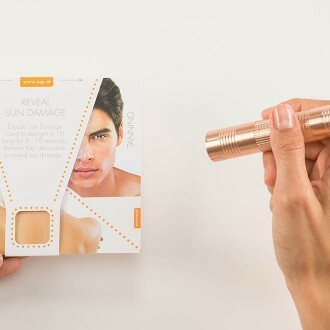 The Sun Damage- Sunburn and Tanning Demo Tool reacts to UV light and simulates the sun’s damaging impact on the skin. 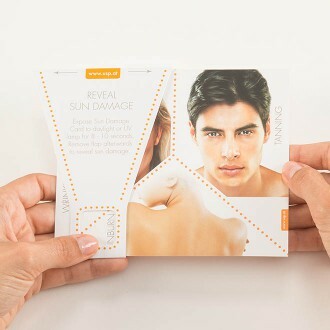 This dramatic test can be used to make your consumers aware of the necessity to protect their skin from harmful UV rays, by using your UV protection products. Furthermore, it can be used with your SPF product to prove your product’s effectiveness against sun damage. 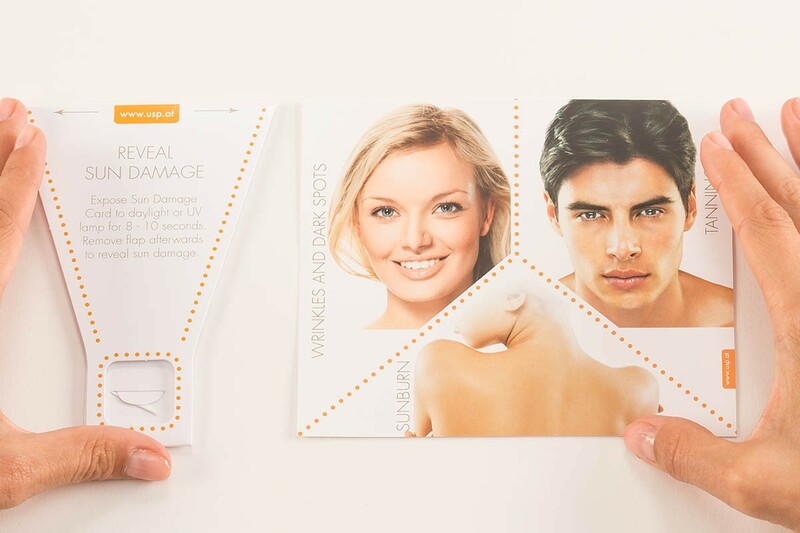 The knowledge about the damage sun can cause, combined with product information, guides consumers to purchase their appropriate sun care selections from your brand. When consumers learn about the effectiveness of your brand they experience an “A-ha” moment. This emotional experience is also referred to as the “Beauty Moment of Truth”. 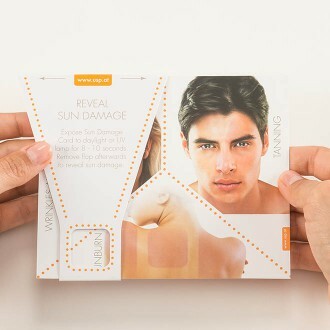 The Sun Damage- Sunburn and Tanning Demo Tool therefore creates an engaging consumer experience. It guides to the right product choice, which is essential when it comes to brand trust and brand loyalty. Most sun care brands offer a wide variety of product choice, each with a different sun protection factor suitable for various levels of UV radiation. Consumers are, however, often unsure about their sun care needs and the damage to unprotected skin. How do you, as a Marketing Executive, guide consumers to the right product choice within your range and prove your product claim? How do you get attention and raise awareness in the first place? Customers often feel overwhelmed by the great variety of sun care products available. Uncertain about their sun care needs and the damage that can be caused to unprotected skin, makes it difficult for them to choose “the one”. Will the product hold what it promises? Which sun care product is right for my skin? Which product out of my favorite brand’s range works best for my sun care needs given a certain UV intensity? We provide Marketing Executives like yourself with multisensory Brand Activation Tools which enable consumers to experience your brand throughout various channels. 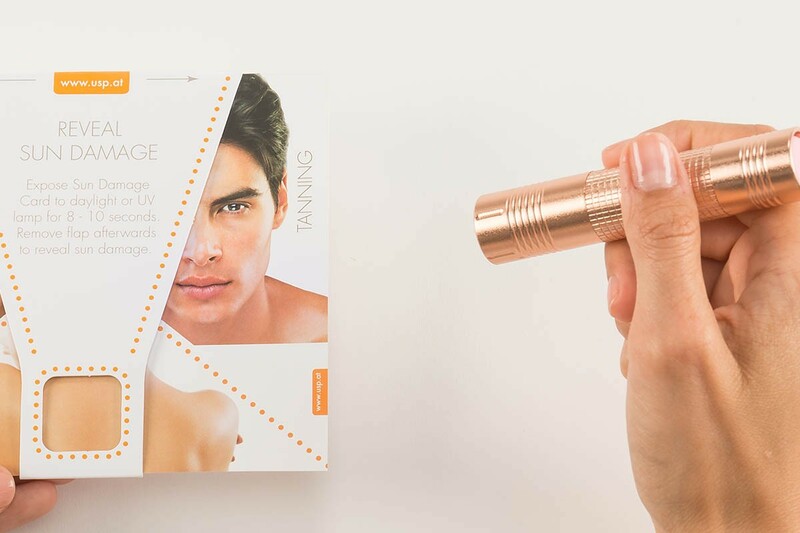 The USP Solutions Sun Damage- Sunburn and Tanning Demo Tool enables your cosmetics brand to design an emotionally engaging and tailor-made “Beauty Moment of Truth”. 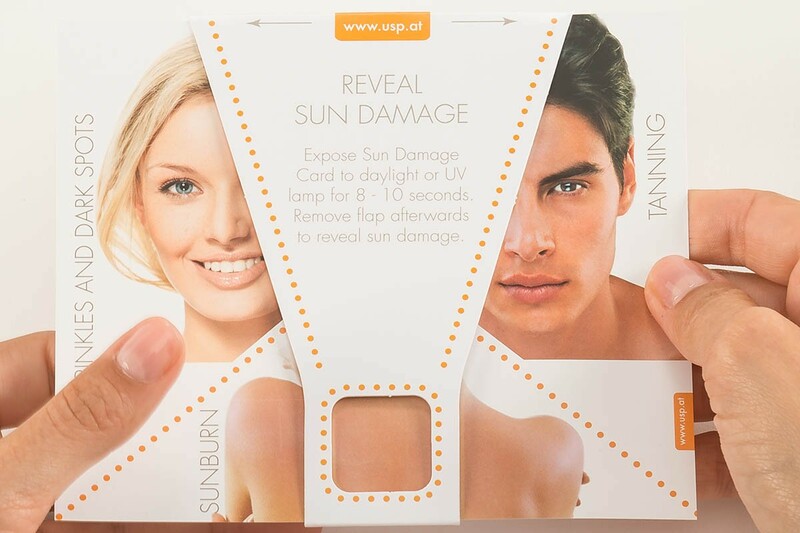 Place Sun Damage Card in front of you. 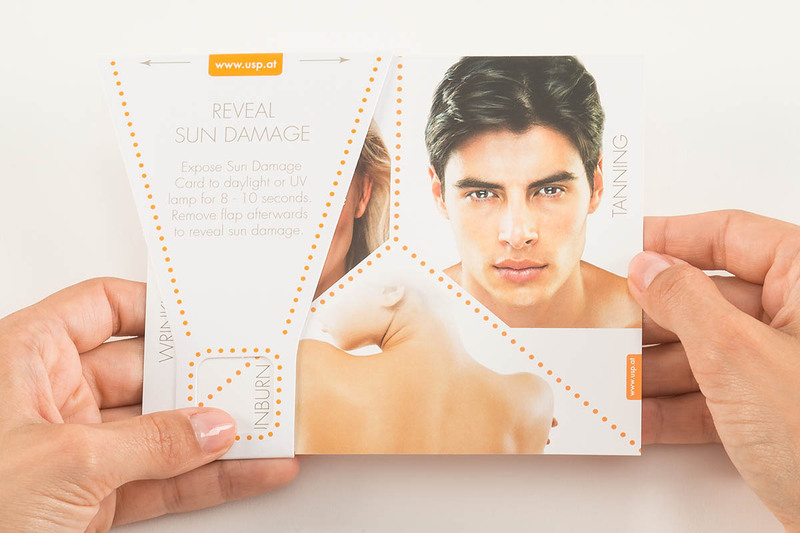 Protect one side of the face with the flap (move flap in the middle of the card). Then expose card to sun or UV lamp (395 to 400 nm) for about 10 seconds. Remove flap and compare protected to unprotected area. The unprotected area shows signs of sun damage: tanning and sunburn. 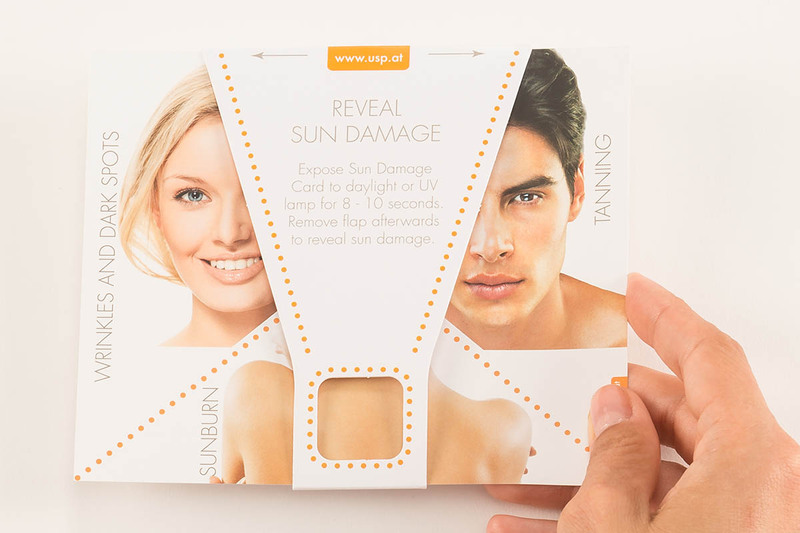 We can easily customize Sun Damage- Sunburn and Tanning Demo Tool and adjust size, shape, material, printing effects and more – so the tool perfectly reflects the uniqueness of your brand. We were MORE than fully happy with your prompt and friendly services. Thank you very much again!